In a large frying pan over a medium flame, heat olive oil. Add in onion and garlic and sauté for 5 minutes. Add in the ground beef, and sprinkle it with cumin and paprika. Break it up with a spatula while it cooks. Once it is all broken into tiny pieces, add in the vinegar and salt to taste. Mix well. Add in the raisin, mix to fully incorporate into the meat and cook until the meat is no longer pink, but acquires a nice brown color. This should take about 15 to 20 minutes. Remove meat from stove, then remove the meat from it’s own juices with a slotted spoon. Place the meat in a bowl, let cool for a bit, and place in the fridge for an hour. While the meat is cooling down in the fridge, boil your hard-boiled eggs, then remove them from the water. Peel them and slice them in half. Set to the side. In a small bowl, whisk together a raw egg and water to make an egg wash. Set to the side. If using Pillsbury® piecrust, unroll dough and cut out as many circles as possible with a circle cookie cutter. Or use empanada wrappers already cut for you. Fill each circle in the middle with 1 half of a hard boiled egg, 1 pitted green olive, and a heaping tablespoon of raisin ground beef. Dip the tip of your finger into the egg wash, then run it along the edges of the piecrust dough. Pull one edge of the dough to the other edge then press along the edges to ensure closure. It should look like a mini taco. Many people either use a fork to further enclose or pinch the edges into a fancy design. Poke the top of the empanada once with a fork. Set to the side till ready to fry. In a little pot over a medium high flame add in vegetable oil, and allow it to get hot. Carefully place an empanada into the oil and fry until the dough is golden brown, about 5 to 10 minutes. Repeat until all empanadas are fried. You can make your empanadas as big as you’d like or as small as you’d like. Cooking time is still the same. I grew up surrounded by Mexican bakeries where sweet fruit empanadas were plentiful. My childhood memories of empanadas come in apple, pineapple or crema. I fondly remember the first time I had an empanada that was filled with meat and seasoned with olives and hard boiled eggs, I was already well into my teenage years. I caught a glimpse of a raisin somewhere in the ground beef and thought it to be genius. Who thought of this? I had no idea at the time that I was eating a traditional Argentinian empanada. Since those days, this flavor combination of ground beef, raisin, hard-boiled egg and a pitted green olive is the one I look for in an empanada. 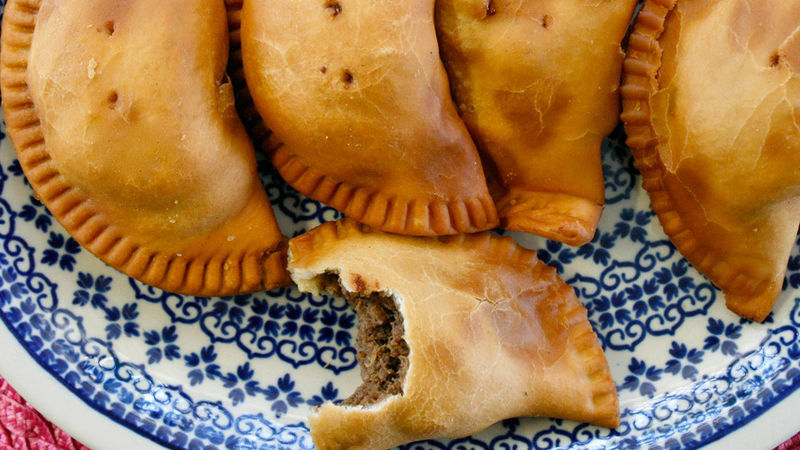 Since it is sometimes difficult to find this delicious empanada from Buenos Aires here in my city, I find the only solution is to make this delicious treat for myself. I have also made them for friends because the pleasure is too intense to not share!